The Tuesday bird walk went to Rathtrevor Beach Provincial Park in Parksville. The morning was cloudy with rain showers and a very strong wind blasting off the Strait of Georgia. We had several good views of Pacific Wrens in the underbrush near the trails throughout the morning. A Brown Creeper caught our attention as it creped up a conifer tree. 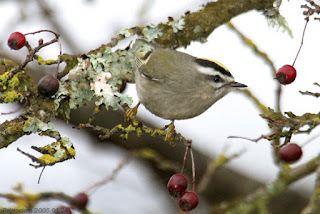 We watched Golden-crowned Kinglets and Ruby-crowned Kinglets were feeding close to the ground during the morning.A flock of Surf Scoters, a White-winged Scoter, Black Scoter and a Long-tailed Duck were seen heading down the Strait. 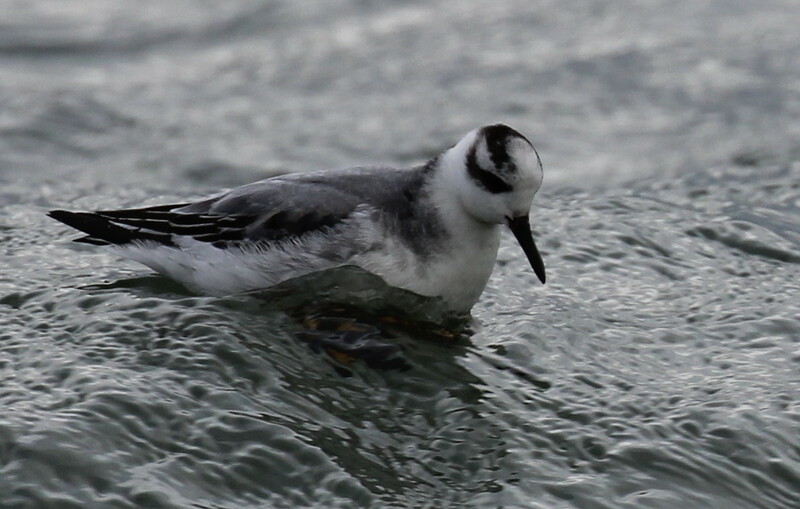 A flock of Black Turnstones flew low over the stormy water heading towards the shore. Golden-crowned Kinglet: Ralph Hocken Photo. This Sunday’s Bird Walk went to Neck Point Park in Nanaimo. The morning was cloudy with very strong winds off the Strait of Georgia. 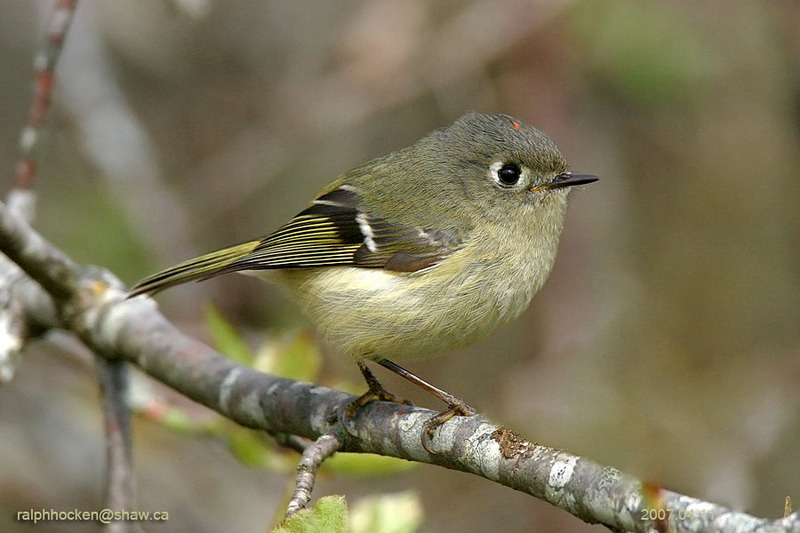 Ruby-crowned Kinglets and Golden-crowned Kinglets were feeding on trees high above us. The bird of the morning was the sighting of a Rock Wren. We watched the bird as it hopped on logs, off logs and underneath logs at the water’s edge. We watched in fascination as three Hump- backed Whales swam down the Strait about 75% of the way to the horizon. Four Trumpeter Swans were flying above whales, also heading down the Strait. A River Otter was seen on the rocks at the Point. A Mountain Bluebird and two Bald Eagles were seen at Pipers Lagoon by many of the birders after the walk. The Tuesday bird walk went to the Shelly Road side of the Englishman River in Parksville. The morning was cloudy with calm winds. A Hutton's Vireo, a Golden-crowned Kinglet and two Ruby-crowned Kinglets played hide and seek with us just off the trail. A Cooper’s Hawk flew over the river just above us giving us quick views. A first of the season Eurasian Widgeon was spotted feeding with a flock of American Widgeon at the shoreline. A Hooded Merganser, a Greater Scaup and a Northern Shoveler were seen just off shore. We watched a Northern Shrike who was perched in the bushes along the edge of the estuary fly off several times only to return to his perch. Everyone is welcome to join us for a 2-3 hour bird walk on Sunday & Tuesday. We leave from the Store at 9 a.m. on Sunday Mornings and go to a different location in and around Nanaimo. We leave from the Parksville Community Park at 9:00 a.m. on Tuesday mornings and go to a different location in the Oceanside area. 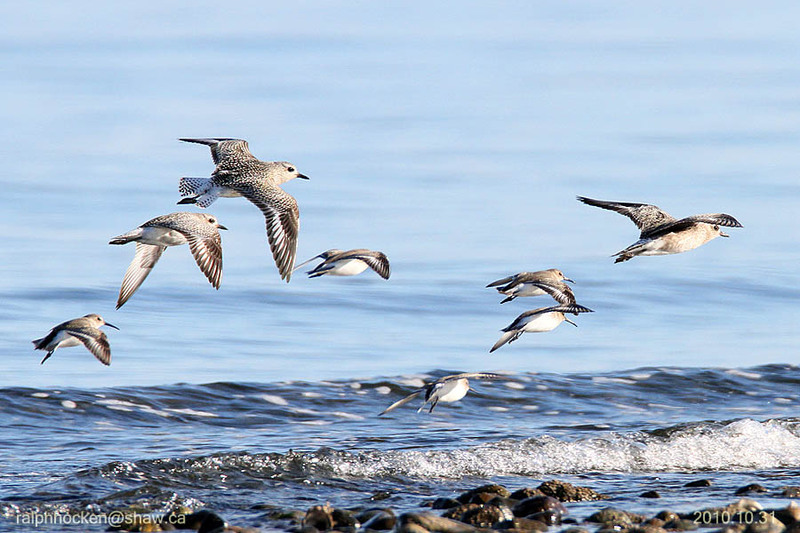 The Tuesday bird walk on November 22, 2016 will be going to Rathtrevor Beach Provincial Park in Parksville. Meet at the Parksville Community Park at the parking lot near the Lions Club Kids Playground at 9:00 a.m. or at the main parking lot at Rathtrevor Park at about 9:10 a.m. The Sunday bird walk on November 27, 2016 will be going to Buttertubs Marsh in Nanaimo. Meet at the Birdstore at 9:00 a.m. or at the parking lot at Buttertubs Marsh off Jingle Pot Road at about 9:15 a.m. The Tuesday bird walk went to the Shelly Road side of the Englishman River in Parksville. The morning was cloudy with calm winds.A Hutton's Vireo, a Golden-crowned Kinglet and two Ruby-crowned Kinglets played hide and seek with us just off the trail. A Cooper’s Hawk flew over the river just above us giving us quick views. A first of the season Eurasian Widgeon was spotted feeding with a flock of American Widgeon at the shoreline. A Hooded Merganser, a Greater Scaup and a Northern Shoveler were seen just off shore. We watched a Northern Shrike who was perched in the bushes along the edge of the estuary fly off several times only to return to his perch. 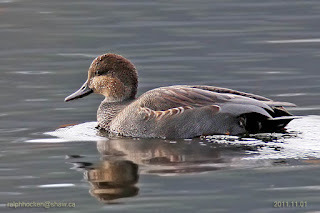 Eurasian Widgeon: Ralph Hocken Photo. 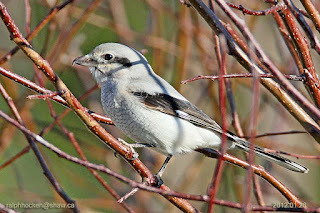 Northern Shrike: Ralph Hocken Photo. This Sunday’s Bird Walk went to Plummer Road side of the Englishman River in Parksville. The morning was cloudy with light rain showers and the winds were very strong off the Strait of Georgia. A flock of Dunlin and a very large flock of Green-wing Teal were feeding on the mud flats. A flock of twenty Brant Geese flew up the strait. Two pairs of Gadwall were seen feeding along the edge of the river. We counted seven Bald Eagles stirring up the ducks and gulls during the morning. A flock of four Barrow’s Goldeneye flew low over head. The Tuesday bird walk went to Deep Bay. This morning was a mix of weather--cloudy with light rain showers, occasional sunny periods and very strong winds off the Strait of Georgia. A flock of Snow Geese flew over head going down the Strait. Four Barrow’s Goldeneye were seen swimming near shore. A mixed flock of Black-bellied Plovers and Dunlin along with one lone Black Turnstone landed on a gravel bar near shore giving us great views. 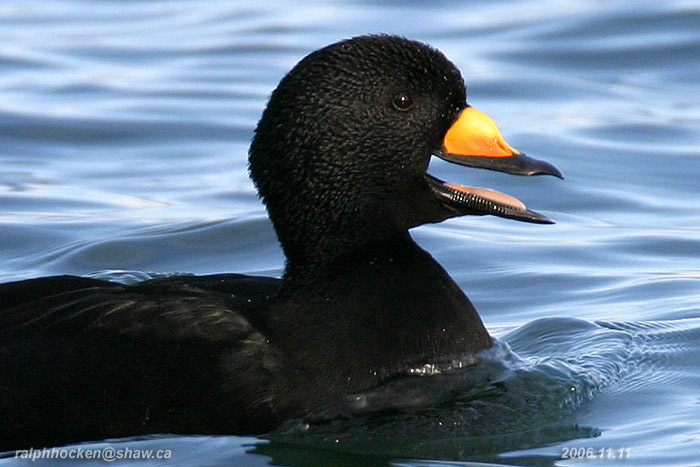 Large numbers of Surf Scoters, White-winged Scoters, Black Scoters, Long-tailed Ducks, Horned Grebes and Red-necked Grebes were seen on the water between the Deep Bay and Denman Island. 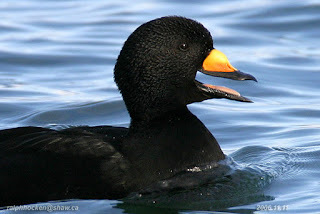 Black Scoter: Ralph Hocken Photo. 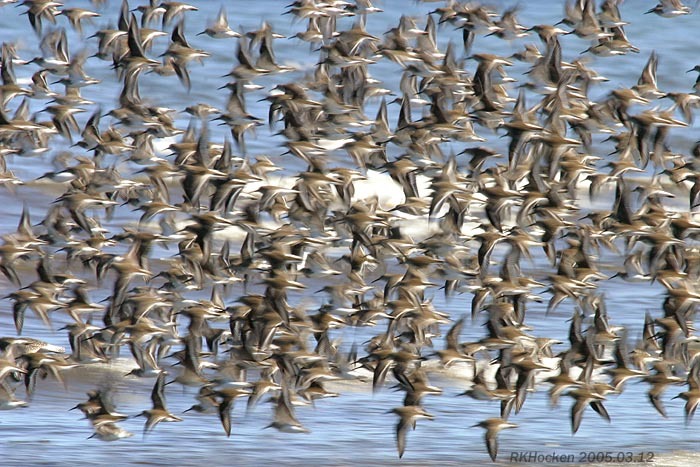 Dunlin and Black-bellied Plovers: Ralph Hocken Photo. 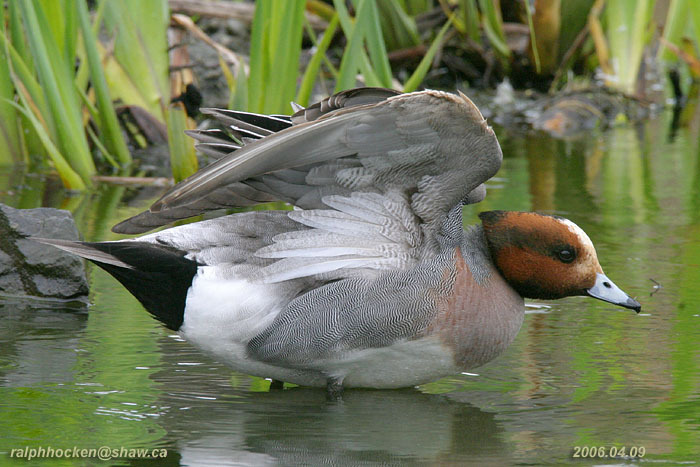 The Tuesday bird walk on November 15, will be going to the Shelly Road side of the English River Estuary in Parksville. Meet at the parking lot next to the Lions Club Kids Playground at 9:00 a.m. or at the end of Shelly Road on the ocean side of highway 19a at about 9:10 am. The Sunday bird walk on November 20, 2016 will be going to Neck Point Park in Nanaimo. Meet at the Birdstore at 9:00 a.m. or at the parking lot at Neck Point off Hammond Bay Road at about 9:15 a.m. 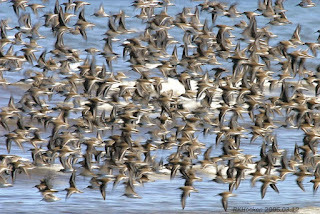 The Tuesday birdwalk on November 15, will be going to the Shelly Road side of the English River Estuary in Parksville. Meet at the parking lot next to the Lions Club Kids Playground at 9:00 a.m. or at the end of Shelly Road on the ocean side of highway 19a at about 9:10 am. This Sunday’s Bird Walk went to Buttertubs Marsh Nanaimo. The morning was sunny with cloudy periods and the winds were calm. We had great views of several Ruby-crowned Kinglets showing their bright red crown. Two Lesser Scaup and an American Coot were seen on the marsh along with many Canada Geese and Ring-necked Ducks. A Green Heron was spotted very quickly from the viewing platform. Two Cooper’s Hawks and a Red-tailed Hawk was seen overhead. Fifteen Snow Geese were seen along Holden creek in south Nanaimo. A Short-eared Owl and three Western Meadowlarks were seen at the end of the spit at Pipers Lagoon in Nanaimo. A Snow Bunting was seen for the last two days at the French Creek Jetty near the gravel spit. 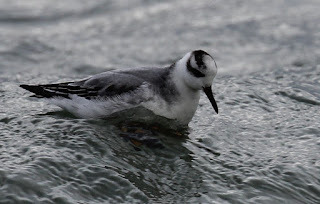 A Red Phalarope and a flock of Surfbirds were seen at the end of the spit at Pipers Lagoon in Nanaimo. 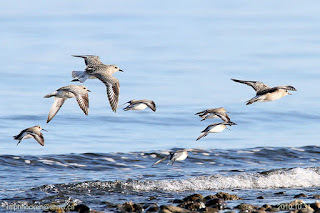 The Tuesday bird walk went to Rathtrevor Beach Provincial Park in Parksville. The morning started out partly cloudy with calm winds but the wind picked up from the Strait of Georgia as the morning went on. Eight Snow Geese were seen at the Parksville Community Park. Two thousand Surf Scoters and White-winged Scoters were seen offshore. Two large flocks of Greater Scaup were seen flying down the Strait. Long-tailed Ducks, Pacific Loons, Common Loons, Horned Grebes, Red-necked Grebes, Brandt's Cormorants and Doubled-crested Cormorants were seen on the water all morning. A large number of Chestnut-backed Chickadees, Golden-crowned Kinglets and Ruby-crowned Kinglets were seen feeding along the edge of the forest. A Hermit Thrush was spotted lowdown in the forest. We spotted a Palm Warbler pumping its tail constantly and moving quickly at the top of an apple tree near the Nature house. 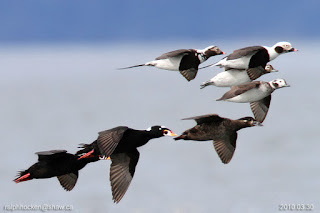 Long-tailed duck with Surf Scoters: Ralph Hocken Photo. 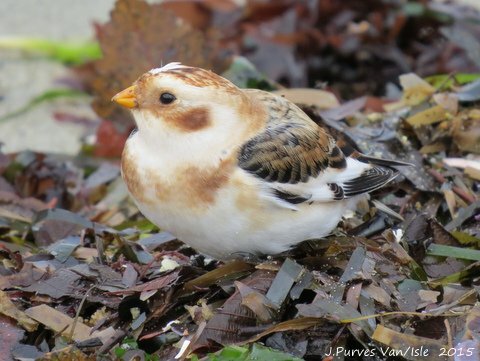 The Tuesday bird walk on November 08 will be going to Deep Bay. Meet at the Parksville Community Park at the parking lot near the Lions Club Kids Playground at 9:00 a.m. or at the parking lot at the Deep Bay Marina at about 9:30 a.m. The Sunday bird walk on November 13, 2016 will be going to the Plummer Road side of the Englishman River in Parksville. Meet at the Birdstore at 9:00 a.m. or at the corner of Plummer Road and Shorewood Drive at about 9:30 a.m.